Proposals by a European Commissioner to slash the cost of using mobile phones abroad, for text, data and voice calls could become law next July. The European Parliament is to vote next spring on whether roaming costs for text messages should be capped. The cost of sending a message is expected to eventually fall by 60% from an average of 23 pence to 9p. Voice calls would fall from 36p to 27p a minute and customers would be able to set limits on data downloads. 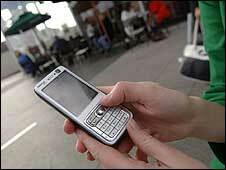 A reluctant mobile phone industry first had limits on its roaming charges imposed by the EU in September 2007. However, those applied only to voice calls, not those for texting or browsing the internet while users were abroad. Mobile phone companies were limited to charging a maximum of about 34p a minute for making calls, and 17p to receive a call. This is now set to be cut again, if EU Telecommunications Commissioner Viviane Reding's plans go through. Customers downloading data would then be able to set a maximum cost level before their service cuts out. This is aimed at preventing "bill shocks", which have been reported when users download a film or television show while abroad, from summer 2010. Last year, Ms Reding demanded that mobile phone companies cut voluntarily the cost of texting and browsing while abroad, or face more limits being imposed by the EU. She later set the industry a deadline of 1 July to fall into line, but no agreement has been reached. She also repeated her accusations that self-regulation had failed, and that the industry's customers were still being ripped off. "I have announced today that enough is enough," she said. "We have to do it [regulation] top down from Brussels in the interests of consumers." She said that the 2.5 billion text messages, worth 800m euros ($1.18bn; £635m), sent every year by roaming customers in EU countries were costing 10 times more than domestic messaging. 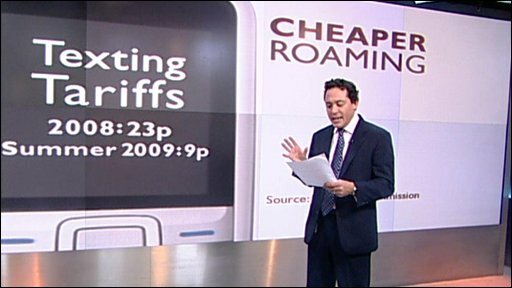 The EU's campaign against high mobile phone calls abroad started in 2005 when Ms Reding denounced roaming charges as extortionate "fantasy costs" which simply penalised customers for using their mobile phones abroad. Travellers from Belgium can pay as much as 0.75 euros per text, the commissioner said. A typical French customer sending a roaming text message from holidays in Italy this summer could pay up to 0.30 euros, while a Czech tourist would pay up to 0.42 euros (10 Czech crown). In Spain, a Swedish holidaymaker could pay up to 0.40 euros (3.79 Swedish krona) per message when roaming, a German 0.32 euros, a Pole 0.47 euros (1.50 Polish zloty), a tourist from the UK 0.63 euros (40p) and a Latvian as much as 0.70 euros (0.49 Latvian lat) per text.